For a relaxed getup, wear an Oscar de la Renta Tweed Trimmed Peplum Hem Cady Jacket from MATCHESFASHION.COM and blue skinny jeans — these two items go really good together. A pair of black suede over the knee boots acts as the glue that will tie this ensemble together. This combo of a black tweed jacket and navy skinny jeans is a safe and very fashionable bet. Complete your outfit with brown suede heeled sandals for extra style points. This casual pairing of an Oscar de la Renta black tweed jacket and blue jeans is a winning option when you need to look chic but have no extra time. Complete this outfit with silver sequin pumps and the whole outfit will come together perfectly. This laid-back combo of an Oscar de la Renta Tweed Trimmed Peplum Hem Cady Jacket from MATCHESFASHION.COM and light blue boyfriend jeans is perfect when you need to look nice but have zero time. Black low top sneakers will add a hint of stylish effortlessness to an otherwise mostly dressed-up look. The mix-and-match capabilities of a black tweed jacket and navy skinny jeans guarantee you'll always have them on high rotation. This getup is completed really well with a pair of black suede ankle boots. Putting together a black tweed jacket with blue ripped jeans is a great choice for a relaxed getup. As for the shoes, stick to a more classic route with beige suede pumps. If you appreciate comfort dressing, consider teaming a black tweed jacket with charcoal skinny jeans. For maximum impact, grab a pair of silver leather pumps. For an on-trend getup without the need to sacrifice on functionality, we like this combination of an Oscar de la Renta Tweed Trimmed Peplum Hem Cady Jacket from MATCHESFASHION.COM and white shorts. 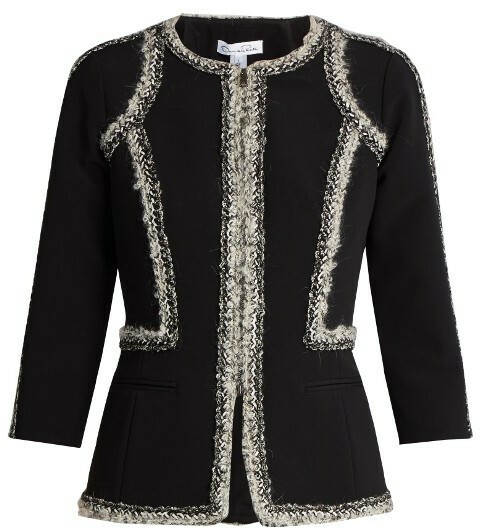 Why not consider wearing an Oscar de la Renta Tweed Trimmed Peplum Hem Cady Jacket and a beige swing dress? These items are totally practical and will look stunning when combined together. When in doubt about what to wear in the footwear department, complement this look with a pair of black suede knee high boots.